280 Rounds of high quality of Wolf Gold 223 55gr FMJ conveniently packed into our very own Black Range Bag. Why buy the same ammo elsewhere in a boring cardboard box when you can get your refresh of ammo in a quality range bag. Stock them up and have ready to go packs, reuse them for other purposes, or give them away as gifts! This is an exceptional value considering the price of similar bags. This deal includes one of our quality range bags in black. 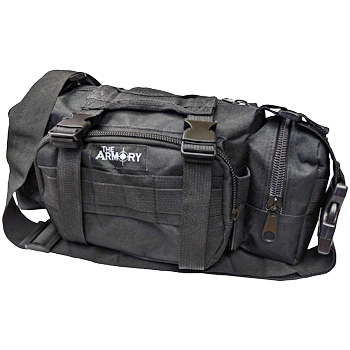 This range bag has a total of 4 zippered pockets, a removable carrying strap, front molle webbing, a vinyl water resistant inner liner, and can be mounted to a belt or molle gear. Both the front and center pocket have additional pockets for organization and holding smaller items. 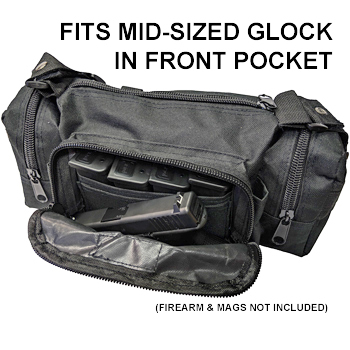 The front pocket is large enough to store a mid-sized Glock, similar pistol, or smaller along with magazines. The inner pocket can hold even larger guns or a bunch of ammo!